In this episode of Absolute Trust Talk, Kirsten welcomes Herb Thomas, founder and principal fiduciary of Herb Thomas and Associates. Herb has a big passion for people, which is shown through his extensive experience serving families throughout California with special needs trusts, public benefits counseling and advocacy, trust/estate administration, and conservatorships. He is also a board member of the Behavioral Intervention Association, which is a nonprofit dedicated to providing intervention services to children diagnosed with autism and their families. During his conversation with Kirsten, Herb touches on what a professional fiduciary is and what makes the job right for someone who has “experienced a little bit of life.” He addresses why it’s essential for a family to look outside immediate members to a resource such as a professional fiduciary. He also provides actionable guidelines and tips for planning around the proper execution of a Special Needs Trust -everything from organization to the rest of the team involved. Herb later weighs in on the biggest responsibilities expected of a special needs trustee and how to get started with a licensed professional fiduciary. Choose a trustee wisely – they are the main ingredient of a successful trust. Have a financial plan set up before you start. Choose the rest of the team wisely. 2:25 – What does it mean to be a licensed professional fiduciary? 4:22 – A professional fiduciary can serve in these various roles. 9:30 – What challenges are faced when administering a special needs trust? 12:41 – Here is why special needs trusts are important – the benefits, and why it’s needed. 15:08 – Here is why you should consider using a professional fiduciary. 24:50 – What is the process to hire a professional fiduciary? How do we find you? 25:47 – Herb discusses who he works with on the trust administration, other than just the beneficiary. 29:40 – Herb highlights the most significant responsibilities of a Special Needs Trustee – consider this when you are deciding whom to choose for your trustee. Assets are important to everyone, whether you have the resources or not. In the case of a special needs trust, the job of a licensed professional fiduciary or trustee is to help protect those assets for as long as possible and to use them solely for the benefit of the beneficiary. It’s vital, going into this process, to have goals to help you achieve what needs to be done for the recipient. To accompany this episode of Absolute Trust Talk, guest Herb Thomas put together a couple of tools to help you get started. “Trustee Can Purchase” is a guide to help the trustee understand what can be purchased for the benefit of the beneficiary. In addition, Herb provided a list of interview questions to ask when you are hiring a professional fiduciary. Above all else, you want to make sure the beneficiary is taken care of adequately and that their needs are met for the rest of their life. Download Trustee Can Purchase Here! 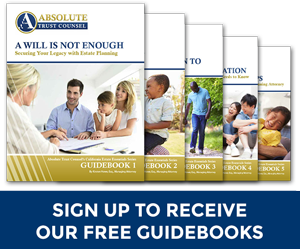 Download What to Ask When Hiring a Professional Fiduciary Here!